The first LIVESEED booklet How to implement the organic regulation to increase production & use of organic seed has been published. Alternative sources of organic seed (from farm-saved seed to Organic Heterogeneous Material). 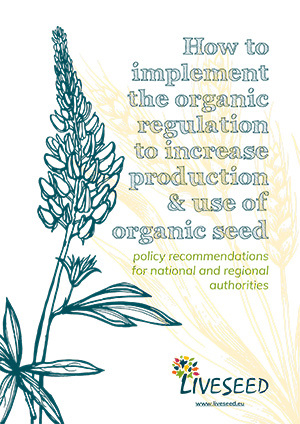 Practical examples from various EU countries help illustrate how the organic regulation, or measures to increase organic seed production and use have been successfully implemented. The booklet was edited by RSR, IFOAM-EU and FiBL-CH and written by Alexandra Fuss (IFOAM-EU), Maaike Raaijmakers (Bionext), Freya Schäfer, Xenia Gatzert & Katharina Brühl (FiBL-DE), Matteo Petitti & Riccardo Bocci (RSR), Tina Kovács (ÖMKI) & Tove Mariegaard Pedersen (SEGES). RSR coordinated the booklet editorial and production process.